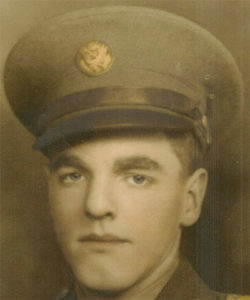 PFC Wilbur Mattern of Oelwein. The remains of a soldier from Oelwein in northeast Iowa were buried today in Arlington National Cemetery in Washington, D.C. on the anniversary of his death. Defense POW/MIA Accounting Agency (DPAA) says 23-year-old Marine Private First Class Wilbur Mattern landed with Company M of the 3rd Battalion, 8th regiment of the Second Marine Division on the small island of Betio in the Gilbert Islands chain. He died on the second day of battle on November 21,1943 and was one of around 1,000 Marines and sailors killed in action with the Japanese as U.S. forces took the Gilbert Islands. The DPAA says many of the soldiers were buried in cemeteries on the island and their bodies were recovered in 1946 and ’47. But Mattern’s body was not recovered until an organization called History Flight Incoporated discovered another burial site on Betio Island in June of 2015. Mattern’s remains were identified using laboratory analysis and dental records. Photo courtesy of the DPAA.